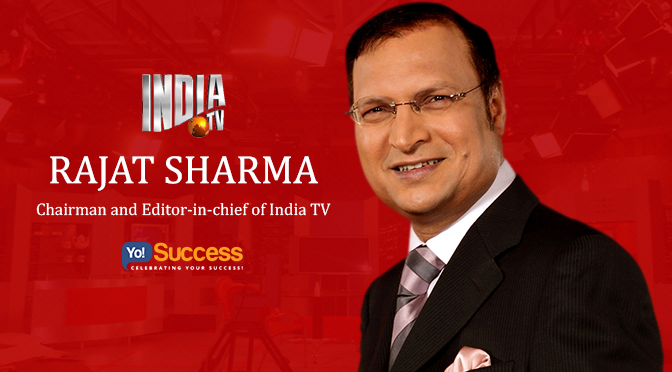 The very famous ‘Aap Ki Adalat’wala man’ & now the Chairman and Editor-in-Chief of the most viewed news channel of India – India TV, Rajat Sharma is one personality that is known to be more famous than most of our celebrities. Married to former TV actress Ritu Dhawan; quite frankly, Mr. Sharma is by far the best known face most powerful editors India has ever had. Well, most of his political relations are minimum 30 to 40 year old relationships, his relations with the Prime Minister Narendra Modi, BJP President Amit Shah and Finance Minister Arun Jaitley, go way back to his youth days. He is close friends with almost every Congress heavyweights and Bollywood’s biggies. His investor list includes most of India Inc’s savviest investors, including billionaires Gautam Adani and Mukesh Ambani, etc. On the 21st anniversary celebration of Aap Ki Adalat that took place in December 2014; Rajat brought literally almost every powerful person of the country from the present PM Narendra Modi, President Pranab Mukherjee, Politicians from virtually all parties, Bollywood biggies including the three Khans – Shahrukh, Salman and Aamir, Media barons including Uday Shankar, CEO of Star India; under one roof. He is so deep rooted that; Rajat had played a key role in India’s negotiations with Sri Lanka on the release of jailed Indian fishermen. He was in Sri Lanka to hold talks with the then Sri Lankan president – Mahinda Rajapaksa, when Rajapaksa called Modi to tell him Colombo was releasing the fishermen. As a matter of fact; it wouldn’t come off as a surprise to many that Rajat today is more influential than many ministers in the cabinet itself. He is one person who if wants, can get a seat in any House, but it’s his humility that keeps him grounded. Obviously, this stature of his is no accident; it is an end result of keeping his credibility first and doing anything to maintain it. Like it is rightly said; “A Success without Struggle, isn’t really a Success in true terms”, similarly, Rajat too had to go through his share of struggles to reach the epitome of power & success that he has achieved today! His early days were spent living in a 10 x 10 room in old Delhi with seven brothers, an ailing mother, father and sister that to without any water and electricity. Schooling for him meant the shabbiest municipality school, bathing was supposed to be done at a communal bathing house and studying for him was sitting under the lamp post at a nearby railway station at night. Yet this humble man has managed to collect fond memories of his childhood. And obviously he took his father’s words way too seriously…!!! Now the story of Rajat’s career, according to him, is vastly divided into majorly three parts! And it all began when he completed his Masters in Commerce! In his first part; he just like any other person was searching for a summer job when he bumped into Janardan Thakur, who had just left Anandabazar Patrika, Old Delhi. Thakur was planning to start a syndicated column and someone to help him out. Without further ado, Rajat was hired as a researcher on a salary of INR 400/month. During that time, one day he took permission from Thakur to use that research information for his own work and went on to write his first story for the Onlooker magazine. And much to his surprise he got paid INR 300 for just that one story he wrote! Since that was a better deal, he joined Onlooker magazine as a trainee reporter and within no time i.e. by 1984, he took over the position of Chief-of-Bureau, and then Editor in 1985. After which he shifted to the land of dreams – Mumbai! Now evidently, success at an early age has its own drawbacks too. People just assume you to be a kid without any experience and similar was the case of Rajat as well! Although they did become friends eventually; but Dom Moraes and Shobhaa De, who were regular columnists back then, simply refused to accept a 28-year-old as an editor! It was after three years of rigorous struggle that Rajat finally moved to ‘Sunday Observer’ & then ‘The Daily’, as editor. After working there for more than 10 long years; he got the second-biggest career defining moment of his life in 1992! On a flight to somewhere, he was joined by Subhash Chandra; he had just started Zee TV and was looking for an interesting interview programme. That is when Rajat narrated him a gist of Aap Ki Adalat and got him interested. Later, much to his belief; Subhash Chandra called him up and asked if he would like to host the show! As much as surprised and shocked he was, within no time he gathered his compose & agreed to the offer, and Aap Ki Adalat went on air on March 13, 1992. From here onwards; Rajat went on to grill high-profiled dignitaries on his popular show for 21 long years. Be it the President, Prime Minister, or the highest of position in any field, he interviewed more than 1000 who’s-who with his trademark smile & harsh questions on the longest running television show in India’s television history. The popularity of the show and Rajat himself was so much that – when he spoke, everybody heard & what he spoke everybody believed! To add to that three years later, in 1995; Rajat created history by launching India’s first much required private television news bulletin – Independent News Service (INS) which was aired across satellite footprints in Asia, Europe and North Africa. This show became the symbol of freedom and unbiased news! They received investments from Fuse+ Media, an entity of ComVentures, a venture capital firm based in Palo Alto, California, United States. After running the show for another 9 years; Rajat decided to enter into the third phase of his career and took the biggest step of his life. In 2004, with undue support from his wife Ritu Dhawan & now the Managing Director of India TV, he launched the soon-to-become India’s largest news channel – India TV! India TV was planned to be a serious news channel on the lines of any other global news channel where Tarun Tejpal would do investigative reporting, Maneka Gandhi would report animal welfare, and Madhu Kishwar was given women welfare. But to his surprise or should we say shock; it soon turned into a nightmare! For the first two very long unexpected years, India TV was bleeding money and had become cashless. The situation was so bad that, Rajat was even forced to sell his property to raise money just to pay the salaries. During that phase he was only left with two options – either accept defeat and shut India TV, or change the way things were being functioned. And we all know which path he chose. Without anymore delay, he revived the programme mix and switched from serious to popular news & added Rajat’s three-hour-long live show in 2008. They made ratings their sole focus and became hungry for popular content all the time. The channel began to rise steadily, and in roughly a year it became the No. 2 news channel. In 2009, Rajat decided to undo the already done! He once again changed the focus from snakes and ghosts, to serious news. And since then believe it or not, numbers state that India TV has the highest rated news content amongst the top three Hindi news channels. When Rajat had launched India TV no one even in their wildest imagination had thought that it will go on to become India’s number one news channel in a short span of four years. And today Rajat Sharma and India TV are called India’s news leaders. Today, India TV has come a long way from a swanky studio in Film City in Noida to a Broadcast Centre that covers an area of more than 1,28,000 square feet in Noida with state-of-the-art digital connectivity. With a staffing of 500 strong members; it reaches out to an audience of more than 90 million C&S homes. “CONTROVERSIES: – In the mid of 2014; Rajat’s name had appeared in an attempted suicide case of one of his female employee On 2nd July 2014; Rajat Sharma replied by sending a legal notice to the victim stating that allegations were false and he reserves the right to seek damages.